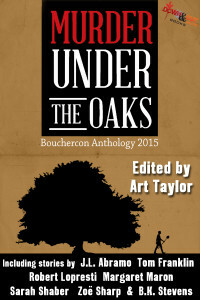 Life Just Bounces into Bouchercon! Woot! I originally wrote this as a short play and when reminded by Thomas Pluck of the fast-approaching deadline for the anthology, hastily rewrote it as a short story. I still think it would great fun for performance. It made me laugh! See the full table of contents at Down & Out Books so you too can be gobsmacked (seriously, what company to be amongst!) and order a copy if you’re of a mind to do so.